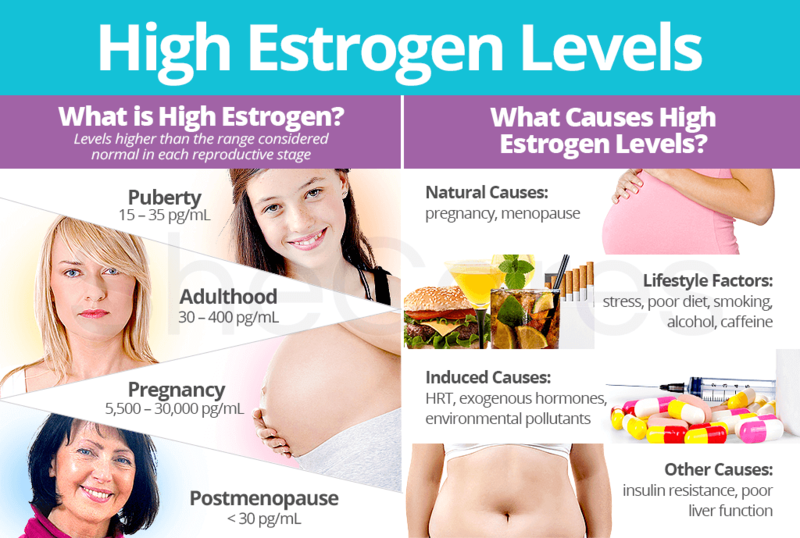 The consequences of high estrogen levels can be just as detrimental as those of low estrogen levels. One of the first steps to resolving the abnormal fluctuation and living an improved quality of life begins with understanding how the imbalance evolves. 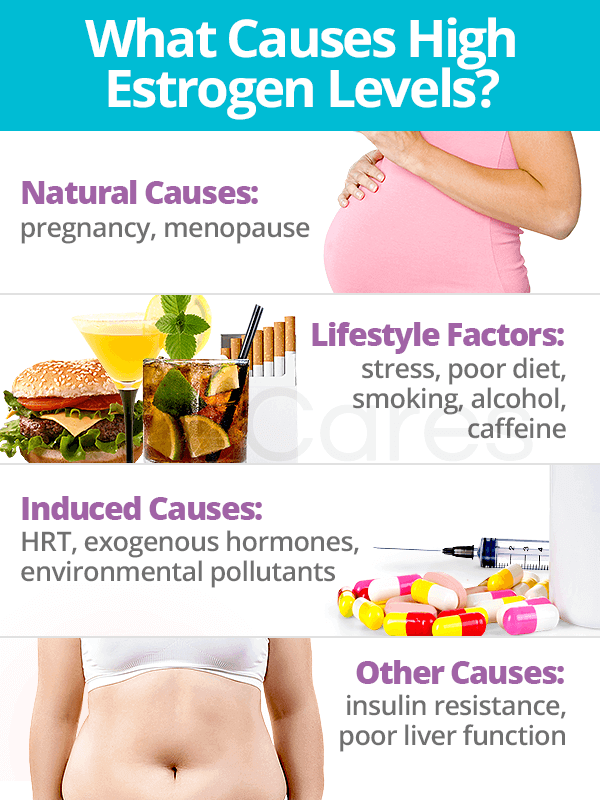 Continue reading through the following sections to learn more about elevated estrogen levels and its causes. First and foremost, elevated estrogen should not be confused with a condition known as estrogen dominance, a more permanent state of hormonal imbalance. The latter is fairly common in women who are obese, diabetic, hypertensive, or those who take estrogen-containing medications. It is acceptable for monthly estrogen levels to range from 30 - 400 pg/mL throughout a woman's life, depending upon where she is in her menstrual cycle and her age. Nevertheless, periods of deviation are inevitable, and these abnormal variations can be caused by a variety of factors. It is not uncommon for healthy women over the age of 35 to have high estrogen levels. However, because they assume it is due to the menopausal transition, they leave the hormonal imbalance untreated. On the other hand, others worsen the condition by further supplementing the body's overall amount of estrogen because they incorrectly interpreted their high estrogen as a deficiency. Luckily, one may take the appropriate steps to healthily lower excess estrogen in the body by first understanding the causes. Estrogen levels shift on a daily basis within the menstrual cycle. Innately, estrogen should be highest during the follicular phase for proper development of uterine lining. Progesterone then takes over as the dominant hormone in the luteal phase after a spike in estrogen triggering ovulation. If a woman doesn't conceive, the uterine lining sheds, and the entire cycle repeats itself. If conception occurs, estrogen levels will continually increase to cause changes in the mother to support her entire pregnancy. Entering the menopausal transition is usually announced with irregular and anovulatory periods, caused by the ovaries slowing down reproductive functions. The absence of ovulation will lead to a drop in progesterone production, which can lead to high estrogen levels as it goes unopposed. A woman suffering from high estrogen levels during menopause will usually have an estrogen reading of 200+ pg/ml. If left unmanaged, the imbalance may lead to a more permanent state of estrogen dominance, which can cause complications such as breast and uterine cancer. Poor diet. Because fiber helps food pass through the digestive system, a low-fiber diet can prevent excess estrogen from being properly excreted, leading to reabsorption. Also, deficiencies in certain key vitamins, such as zinc and magnesium, can contribute to high estrogen levels. Stress. Adrenal gland production and excretion of cortisol, the stress hormone, increases under extreme stress. In order to produce sufficient levels of cortisol, the adrenal glands may suppress progesterone production, causing elevated estrogen levels in a progesterone-deficient state. Smoking. Research has shown that smokers have lower progesterone metabolite levels during the luteal phase due to a shortening of their follicular phase. Shorter follicular phases may result in poor follicle development, which leads to inadequate corpus luteum function. The corpus luteum is responsible for progesterone production after ovulation. Alcohol use. Research has proven that circulating levels of estrogen are significantly higher in women who drink. In one study, blood and urine estrogen levels increased over 30 percent in women who drank two daily alcoholic drinks. Additionally, damage to the liver from excessive alcohol consumption hinders estrogen excretion. Caffeine. Excessive caffeine intake has been shown to increase estrogen production and secretion, depending on ethnicity. Additionally, caffeine depletes vitamin B stores and impedes proper liver function, further increasing estrogen. Hormone replacement therapy (HRT). Estradiol levels could climb to levels that are fundamentally disproportionate throughout estrogen therapy. Not only could this increase a woman's chance of blood clotting problems, but it also puts her at risk of contracting endometrial cancer, strokes, breast cancer, and more. Consumption of exogenous hormones. Another trigger of high estrogen levels includes usage of certain prescription drugs - such as steroid medications, ampicillin, phenothiazines, tetracyclines - and medications containing estrogen, such as birth control pills. Environmental pollutants. Xenoestrogens are man-made chemicals in the environment that mimic natural estrogen when ingested, altering normal hormone functioning and increasing estrogen levels. They're found in beauty products, pesticides, plastics, commercial meats, and more. Insulin resistance. With insulin resistance, the body doesn't properly regulate the amount of glucose in the blood, which can cause an increase in body fat. In turn, extra estrogen can be produced from this body fat. Poor liver function. Reabsorption of estrogen back into the body or generation of elevated estrogen levels can result from improper liver functioning. The organ is responsible for the metabolism and excretion of estrogen. Paying attention to hormonal levels is important before imbalances develop into more serious complications. Continue reading to learn more about the signs and symptoms of high estrogen.